We make almost everything from scratch: delicious jams, breads, pastries, yoghurts, olive oil, and even source our honey from Berber mountain villages. We buy our produce from organic producers wherever possible. Organic comes naturally, and we cook with the rhythms of the seasons. Our menu changes daily according to what is fresh and at its seasonal best. Discover some of Morocco's most famous dishes, that you are unlikely to find anywhere else, such as the magical Trid, one of our signature dishes, and one of great history and lore. Imagine tasty layers of light, buttery pancakes with quail or poussin and a delicious lemony onion sauce--you will be sure to ask for thirds! You might also delight in the succulent, traditional Marrakech dish, Tangia, a slow-cooked beef that is meltingly tender, having cooked overnight in the coals of the hammam fire. Whilst we do propose a range of dishes every day, guests may also request special choices to suit their own palates. With daily cooking classes, there is also the option to learn how to make each dish, in a comfortable setting, with one-on-one tuition with the kitchen staff. Our breakfast menu offers a range of traditional Moroccan and international choices; our lunch menu is an a la carte offering which changes with the seasons. We offer a range of attractive board packages as well, with a breakfast-only, half-board, or full-board option. 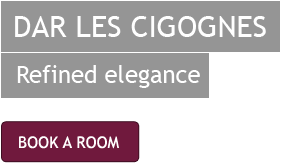 Please inquire at the hotel concierge@lescigognes.com or when making your reservation info@lescigognes.com.